There are stepwells and then there are tanks. Tanks do not have a well shaft but they are interesting in their own right. They generally accompany temples or sometimes mosques as in the case of Jami Masjid at Champaner. Tanks come in different shapes, sizes and designs of steps leading to the water level. Perhaps the first tank I have seen is the one at Hanamkonda in Andhra Pradesh. The tank at Modhera is far more elaborate. But stepwells, they are something else altogether. In modern wells, a brick parapet surrounds the well shaft at ground level. Water is drawn by a pulley system. Modern day bore wells are even simpler. Manual labour is eliminated as water is pumped from below by electricity. In the ancient stepwells, getting water was more a ritual, a sort of a pilgrimage in itself. Water was always seen and revered as the giver of life. The personifications of Ganga and Yamuna so often found at temple doorways are evidences of such a veneration. Women had to walk a long way below ground by a series of steps to the level of water. Nanda – the simplest and common type with one flight of steps leading to the shaft. Bhadra – two flights of steps aligned in line with the shaft in the middle. Jaya – three flights of steps perpendicular to the adjacent ones and arranged in three directions around the central shaft. Vijaya – similar to Jaya but in four directions. Stepwells are common in Gujarat and Rajasthan. Ground water was an important source in these arid regions. But there are stepwells in other parts of India as well. The first stepwell I had seen was a 10th century stepwell at Udayagiri in Orissa. The next was a similar well at the Western Group of temples at Khajuraho. Both these are simple with a single entrance to a long narrow stairway descending to the water level. There are no sculptures or pillared pavilions at the landings. There is similar well at Vidisha with a couple of sculpted pillars. Then at Mandu in Madhya Pradesh I came across the wonderful pair of Ujali Baodi and Andheri Baodi; both these are more elaborate stepwells but nothing close to the beautiful wells of Gujarat. 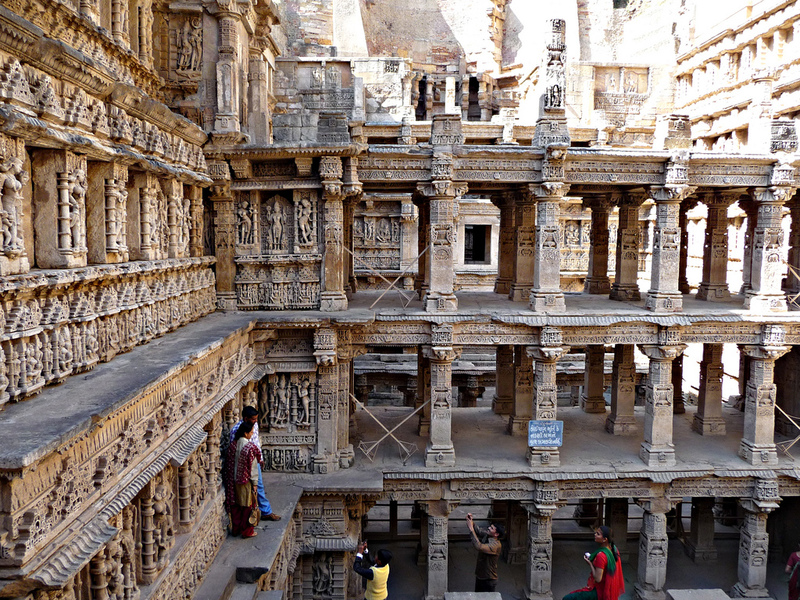 Rani-Ki-Vaav (Queen’s Well) at Patan: One of the most famous of the Gujarati vaavs is the Rani-Ki-Vaav at Patan. It is reputed to have been built by Udaymati in memory of her husband Bhimdev I (1022 -1063) CE during the period of the Solanki dynasty5. It is a fine example of the architecture of this period. It measures approximately 64m long, 20m wide and 27m deep. Interestingly, the Rani-ki-Vaav is multi-storied, with colonnades and retaining walls that link the stepped tank to a circular well. Columns, brackets and beams are embellished with scrollwork and wall niches are richly carved depicting Lord Vishnu and his various avatars, alternating with maidens flanked on the walls surrounding the staircase. The last step of the well leads to a small gate which is the entrance to a 30 kilometer long tunnel which is now blocked by stones and mud. It is said that this tunnel was used as an escape route by the kings during times of war. It is believed that around half-a-century ago, this area was famous for Ayurvedic plants which were used in the treatment of viral diseases like a fever. Rani-ki-Vaav was included in the list of UNESCO world heritage sites in 2014. Adalaj Vaav, Ahmedabad: Adalaj is a small village near Ahmedabad. Over the centuries it was a halting place for travelers. A fine example of Indo-Islamic architecture, it was built by Queen Rudabai in 1499 CE. 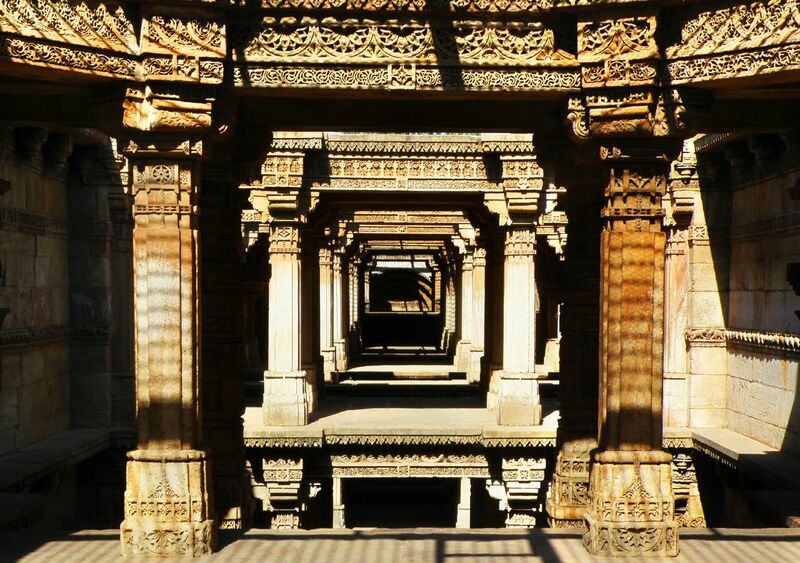 It contains a five storied stepwell combining Islamic, Hindu and Jain motifs. Mythological scenes adorn the walls. A feature that attracts many visitors is the Ami Khumbor (a pot that contains the water of life) and the Kalpa vriksha (a tree of life) carved out of a single slab of stone. There is also a small frieze of navagraha (nine-planets). 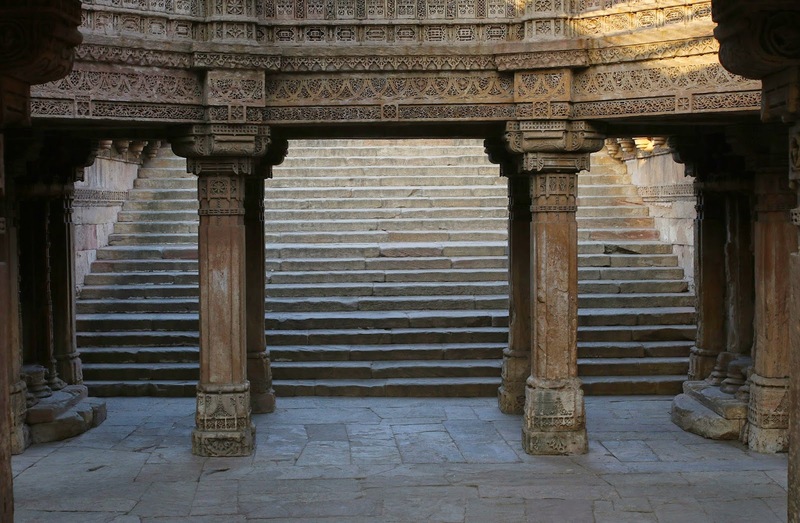 The vaav is octagonal in shape and is built out of sandstone and is richly ornamented. There is a three-dimensional lattice with stone floor slabs running across. This creates a rhythm of light and shade which is very pleasing to the eye. The temperature inside the well is reputed to be about 5 degrees lower than the outside ambient temperature. The women who came to fetch water were tempted to linger here and worship the gods and goddesses and to exchange notes with their friends8. It is even said that the rich sculptures that adorn the walls of the vaav resemble those that are found in palaces. Gebanshah’s Vaav, Champaner: Reputed to have been built in the 16th century CE by a fakir named Gebanshah, this stepwell comes under the category of the Nanda type. In general, steps alternate with covered landings which are called kutas. The well-lit well is completely open to the sky revealing a wonderful view of the beams and pillars crossing one another at angles. This is like looking at the skeleton, the very bare bones of well construction. Ornamentation is minimal and can be seen in kumbhas below beams lining the well walls. It is estimated that the well is 20 meters deep with the shaft having a diameter of 6 meters. The length of the well at ground level is about 50 meters. There is still water in this well. 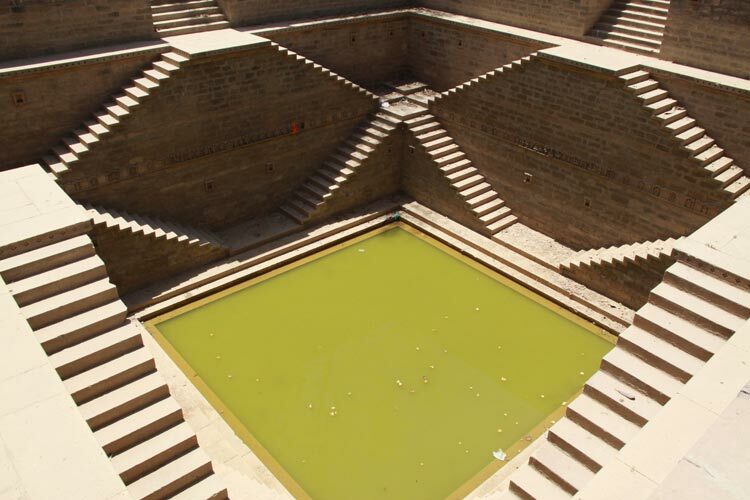 Dada Harir Vaav, Ahmedabad: This octagonal stepwell of Gujarat is situated in the Asarwa area of Ahamedabad city in Gujarat. It was built by the Muslim king Sultan Bai Harir in 1485 CE and thus it got the name of Dada Harir Vaav. This stepwell is of the Nanda type with the staircase leading in the east-west direction. On the eastern side of the well there is an open octagonal pavilion. The steps lead down westwards through many landings. There is also a rectangular tank for storing water. The well is designed in five levels, the east level being octagonal in shape. Each level is provided with finely sculptured pillars and volute capitals. 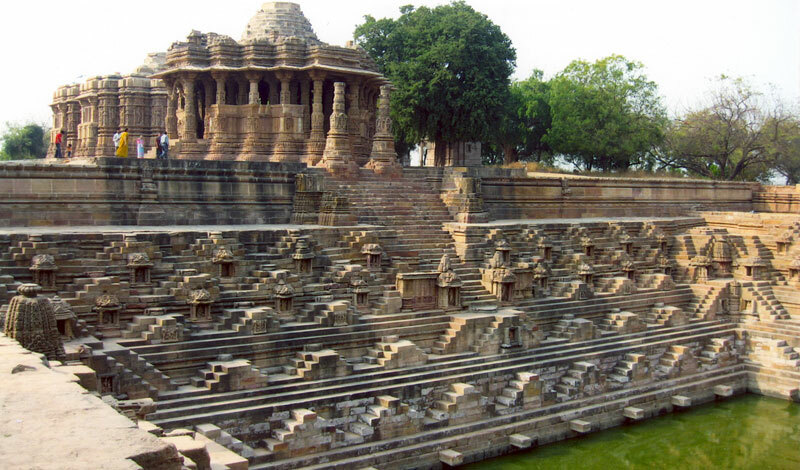 The niches are full of finely sculptured stone work and parapets of kumbha or geometric friezes. The builder has also provided stone ledges for people to take rest. Each stair also contains a square domed kiosk with an overhanging chajja (cover of a roof). The pillars and platforms rise vertically one on top of the other. The steps are open to the sky, whereas the kutas (landings) are closed with stone slabs. The well shaft is circular. There are passage ways at all levels which connect the shaft to the octagonal space above the tank. The shaft wall is covered with geometric designs. Adi-Kadi Vaav, Junagadh: Situated at the foot of the Girnar hills near Junagadh in Gujarat is an ancient stepwell that can be dated to as far back as 319 BCE. Lying undiscovered for many centuries, it was brought to light in 976 CE. It was rebuilt by many kings over the centuries. 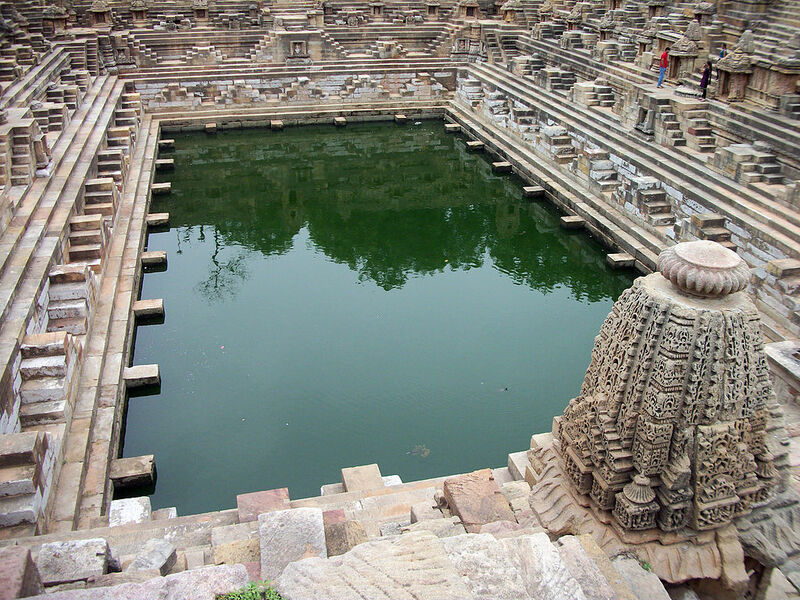 The two important stepwells are Adi-Kadi vaav and Naugham Kuva. An interesting feature of these wells is that they have a zig-zag staircase which is unusual. These two wells are unique in that most step-wells are dug in the subsoil and rock layers, and the columns, floors, stairs, and walls are built in the normal way; however, these two wells have been hewn out of the original rock. This means that the well itself has been built from a single stone. One of the vaavs is named Adi-Kadi Vaav, built in the 15th century CE. It belongs to the Nanda type of well. It is reputed to be one of oldest stepwells in the country. This well contains a straight approach to the circular well shaft. The shaft appears to be apsidal (semicircular) at the bottom. 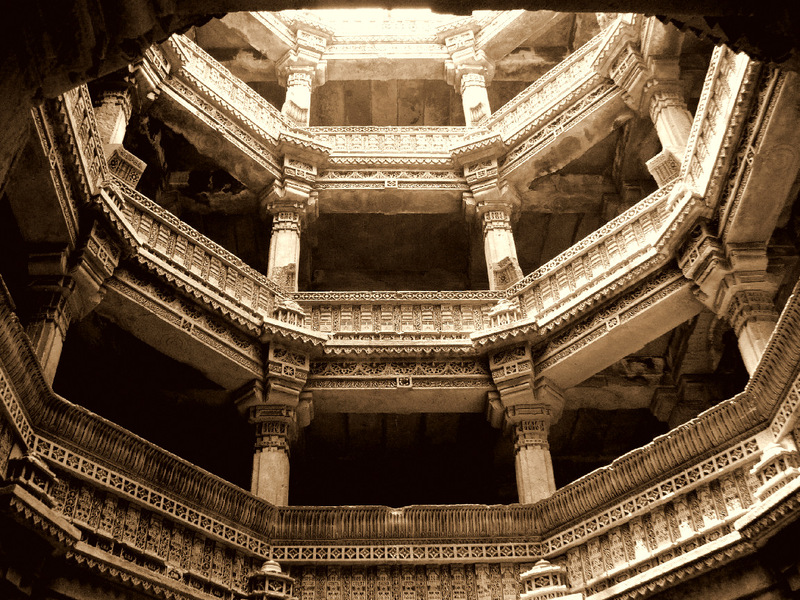 Unlike most stepwells of Gujarat, the Adi-Kadi Vaav does not contain any decorative motifs or even any beams or pillars. The steps are carved straight into the hard rock. A flight of 120 steps leads down to the water. There is an interesting legend connected with this well. It is said that when the workmen started excavating the rock, they found no water. The royal priest advised the king that two unmarried girls should be sacrificed before water could be found. Hence, two girls by the name of Adi and Kadi were sacrificed, and it is said that water was found at the spot thereafter. Another version says that Adi and Kadi were the two girls who fetched water from the well every day. In any case, even today, people still hang cloth and bangles on a tree nearby in their memory. Navghan Kuvo, Junagadh: Hewn partly out of the soft rock, Navghan kuvo is almost a thousand years old being constructed in the year 1026 CE. It is a shining example of the early rock cut architecture of the period hewn into the rock. This well sustained the town of Uparkot through many a long siege. A flight of spiral stairs leads down 52 meters to the water. The shaft itself is square shaped. Openings in the side wall let in light. The well is surrounded by a large forecourt. The well itself is much older than the forecourt. The well is named after Ra’Navghon (1025 -44) CE. The forecourt can be dated to the reign of Ra’Navghon. It is possible that this step well is one of the oldest to be found in the country. If you are traveling to India please do check our Travel Checklist for India.